New Cycle Sport out now! Cycle Sport June is available in newsagents from Wednesday April 14, and it’s a massive 172-page issue packed with the best writing and photography of professional cycling, all for our usual low price of £4.10. 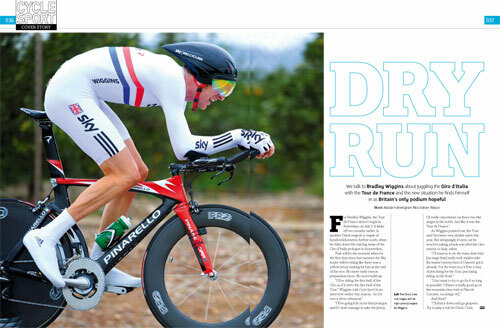 We’ve put Sky’s Bradley Wiggins on the cover, along with a major interview with Britain’s Tour de France hope. 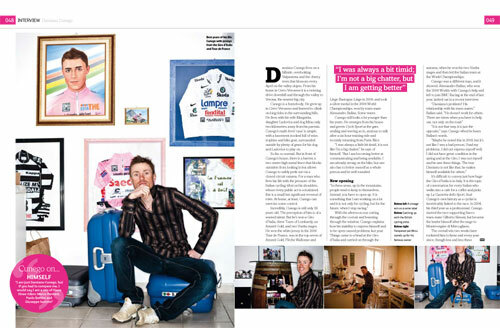 For his Tour preparation, Wiggins is riding the Giro d’Italia. The Sky plan is to treat the Italian race as if it were the Tour de France for two weeks, and then, in Wiggins’ words, “go grupetto” for the final week. But with a relatively weak field, and Wiggins already enjoying good form, there’s a possibility that he could even be in the pink jersey after the team time trial and early mountains. Will he take his foot off the gas? Will he change his plans and go for the win, if he is in a position to do so? Or is it even possible that Sky are actually targeting the race, with the mouthwatering possibility of a first ever British victory in a Grand Tour? Wiggins tells all, in our exclusive interview. 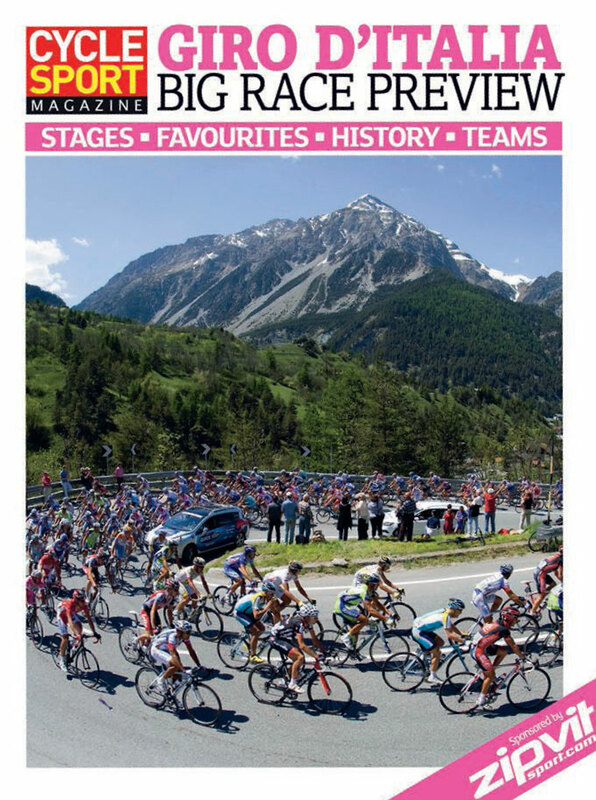 A free 32-page guide to the Giro d’Italia – the peloton may well be right in the middle of the Classics season, but we’re taking the chance to have a look ahead at the first Grand Tour of the year, with full route and stage details, fantastic photography, a look at the favourites and a special retro feature on the first ever all-American team to tackle the Giro, 7-Eleven. 2010 will be the 25th anniversary of the US team’s debut in the event, and we talk to some of the riders who took part. We’ve got an exclusive and revealing interview with mercurial Italian star Damiano Cunego, along with superb at-home pictures taken by our photographer Richard Baybutt. Cunego talks openly and honestly about the difficulties he has in relating to his team mates, both at Lampre and in the Italian world championships team. “I’m already strong on the bike, but I also have to learn to better myself on the whole and be better rounded,” he tells us. He also reveals that he’ll not be riding high in the general classification of the Grand Tours this year, but targeting mountain stage wins, and the Classics. 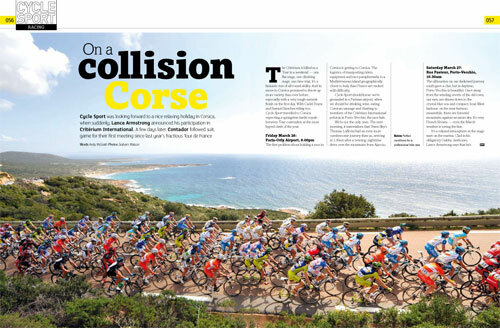 Our writer Andy McGrath decided to go to Corsica for a look at the Critérium International, in its new home. No sooner had we decided to attend the race, then Lance Armstrong announced his participation, and then a few weeks later, Alberto Contador did the same. Suddenly we had a race on our hand, but as Andy reports in his behind-the-scenes eyewitness diary of the weekend, it didn’t turn out how anybody expected. The third instalment of our already-popular Great Races feature looks at one of the most unusual Classics of the 1980s, the 1982 Milan-San Remo. An early break went, including a couple of new young French pros, nothing unusual about that. But it stayed away all the way to the end. We’ve talked to winner Marc Gomez, runner-up Alain Bondue, and five other of the participants, including Moreno Argentin, Claudio Bortolotto, Tommy Prim and Vittorio Algeri, about their memories of the race, and unearthed some classic vintage photography. Iconic Places visits cycling’s booziest hill – the Cauberg, which is the finishing climb of the Amstel Gold Race. It’s neither particularly long, nor particularly steep, but what it lacks in toughness it makes up for in sheer exuberant atmosphere. We say, cycling needs more climbs where the first half is entirely lined with pubs. We’ve taken a long, hard look at the Liquigas team, who are enjoying a good 2010. With four genuine Grand Tour contenders – Ivan Basso, Vincenzo Nibali, Franco Pellizotti and Roman Kreuziger, anybody would be envious of their line-up, but we ask, is the team too top-heavy, and who will really lead at the Giro and Tour? Our regular Team Issue spreads feature bikes from the Quick Step and Lampre teams. We’ve got our hands on Carlos Barredo’s Eddy Merckx EMX-5 and Matteo Bono’s Willier Triestina Cento1 Superleggera. Don’t worry, we wiped off the drool marks after seeing how stunning these bikes are. There’s also an exclusive interview with optimistic Aussie rider Matt Lloyd, who talks about the positive benefits of broken bones and bedrest. Lloyd missed last year’s Giro after a terrible crash in Amstel Gold, but bounced back to support Cadel Evans at the Tour, Vuelta and World Championships. Now Evans has left Omega Pharma for BMC, Lloyd is setting his ambitions to finishing in the top 10 of the Giro d’Italia, and he’s confident he can do it. Pro Performance takes a look behind the scenes at the men who keep cycling teams running smoothly – the mechanics. No longer the grizzled old men with spanners, a new generation of mechanics are coming through, who’ve had to adjust their skills as more intricate and electronic equipment comes onto the scene. 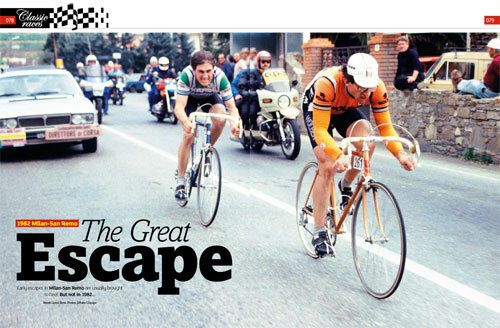 We’ve also got all our regular features – Graham Watson’s column, Broomwagon; Post-Race Banter explains Ghent-Wevelgem and the Tour of Flanders; Shop Window; a Q&A with trackie-turned-road-sprinter Theo Bos; Toto, especially funny for people who aren’t British this month; Clash of the Month; Top 10 ill-advised marketing campaigns featuring cyclists; We ask what Alejandro Valverde is doing still racing when he should by all rights be serving a doping ban; stats, news, analysis, plus incredible cycling photography from the first Classics, and more. That’s 10 in-depth features, and 172 quality-packed pages, for our usual low price of £4.10. 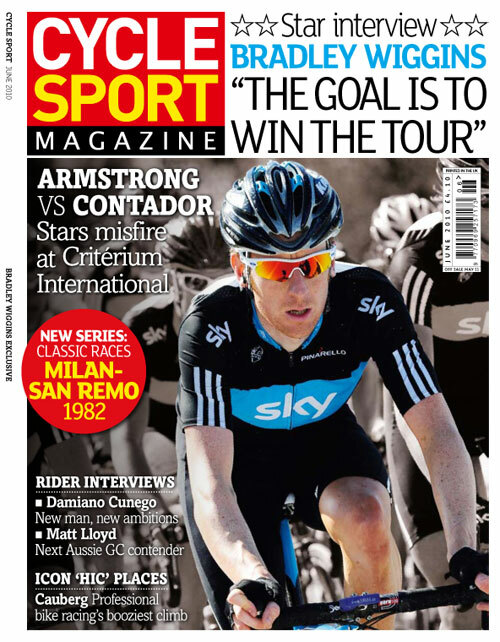 Cycle Sport June 2010 issue goes on sale on April 14 in the UK. Later in the US.